Semi-automatic guns connected to the internet for your viewing pleasure? That’s the reality at CES 2015, where the now ubiquitous Internet of Things concept is taking over – with wireless functionality for anything from washing machines to picnic baskets. The IoT concept is not a new one: people have wanted to imbue all manner of inanimate objects with the ability to sense, warn, advise and manipulate since the advent of wireless technology. But it took on new meaning this year at the annual Consumer Electronics Show in Las Vegas. Samsun CEO Boo-Keun Yoon took to thestage to give a speech largely centered on the concept. “It’s 2015 and we’re going back to the future,” he starts. Thereafter the IoT catchphrase gets mentioned with steady regularity. Although Samsun wasn’t really presenting anything new, the CEO forecasted how 90 percent of our technology will have some sort of intelligent, predictive wireless functionality in a matter of years. Put simply, the IoT department is where the large chunk of the action took place this year. First up – smart guns: rifles equipped with internet, made by a company already famous for precision-guided personal firearms allowing even the lousiest shot to kill moving targets from a mile away. 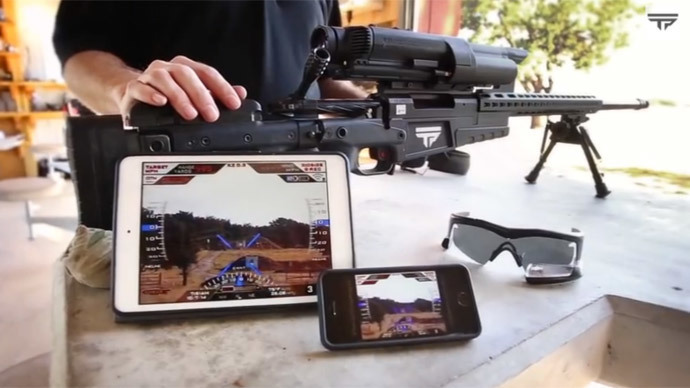 The Texas-based company, Tracking Point, whose rifles run on the Linux operating system, now wants to make things more entertaining for the viewer. Having previously played with Google Glass to allow you to shoot targets from behind cover, the company has just come out with ShotView, which is an iOS and Google Play app that lets you stream your entire hunting experience from the scope right to anyone’s computer across the globe. The benefits of this are lauded by creators and IoT advocates alike. "Now that the firearm is networked, the sky is the limit," the company’s VP for engineering added. Of course it remains to be seen just how far remote viewing of kills will be taken when it comes to military usability. Next up is a whole host of new car technologies also promising to make your vehicle much smarter. Following on from Google’s announcement of a driverless car, and several manufacturers also getting in on the technology, Mercedes-Benz, BMW and Audi are joining the fray. Audi’s A7 concept drove itself all the way from San Francisco to the show in Las Vegas’s Convention Center. Nvidia, the video card maker, contributed to the tech inside the cabin, as with the driving system itself. Other manufacturers, including Volkswagen and Hyundai, paraded their upgraded electronic parking features, while Mercedes stunned viewers with its F015 Luxury in Motion research vehicle, which combines self-driving with incredibly intelligent cabin features and clean energy… sadly only slated for 2030. This year CES promises tech breakthroughs in numerous categories: from eagerly-awaited upgrades or gadgets appealing to the couch potato in you, to the downright futuristic and of questionable necessity to someone from only a decade ago. The Internet of Things is now ubiquitous. Those whose needs do not border on the insane were very happy this year to see much sought-after upgrades in the form of faster chips (thanks to Intel for finally releasing the Broadwell), or home network systems that promise to unite all your entertainment into one neat wireless hub (thanks D-Link). Others looked for things you probably didn’t know you needed – like Kube, a picnic box that combines a portable audio speaker with, well, a box. The list goes on to include a robot washing machine and things like the intelligent doorbell. Other still focused on bringing you something you suddenly find out was missing from your life – like a smart coffee maker, or the Parrot H2O plant irrigation system that monitors for sun, moisture, soil, even waters your plant remotely when it’s feeding time. Or a mirror from Panasonic that tracks you so precisely it allows you to try a number of makeup options and other additions that blend seamlessly with your face. But among the 4k TVs, smart plant watering systems, 3D tech and home entertainment hubs, there was ‘one device to rule them all’ – the AllJoyn Gateway Agent, which allows you to connect all your external and cloud storage gadgets into one hub that gets its instructions from a remote service connected to the AllJoyn network. Through it you can fine-tune the controls and implement various shortcuts to enable your devices to do things you do as part of your own routine. To top it off there is a high-tech privacy and security system with end-to-end encryption. So, whether X-Box One’s scary camera concept made you slightly wary of the blurred lines between privacy and the outside world, CES 2015 makes it abundantly clear that integrated homes and powerful user-specific monitoring and adjustments – all monitored and affected from a distance – are about to become our everyday companions.